Your contributions have helped us restore the historic Weiler Building in downtown Portland into a wonderful home for John Jay Center for Learning. 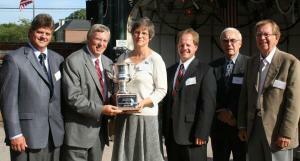 On September 13, 2008, Historic Landmarks Foundation of Indiana presented John Jay Center for Learning, Inc. with the Cook Cup for Outstanding Restoration of an Indiana Landmark for the superb restoration of the Weiler Building. We invite you to stop by for a tour of our historic building. We look forward to serving this community for generations by providing new opportunities for lifelong learning. Read about the Weiler Building's history or watch our PBS Saving Places video.